He says Mueller needs to prove investigation is not a "witch hunt" before Trump agrees to interview. WASHINGTON — President Donald Trump’s attorney, Rudy Giuliani, said Sunday that the president wants to testify in special counsel Robert Mueller's Russia investigation, but his legal team won't recommend an interview unless "they can satisfy us that there is some basis for this investigation." Giuliani said on NBC's "Meet the Press" that Trump's legal team is asking investigators for a "factual basis" for any interview. "We're not asking to show us that he committed a crime," he said. "Of course he didn't commit a crime. They can investigate forever. They're not going to find any of that. What we're asking them for is: Is this the witch hunt that a lot of people think it is? Or is there a factual basis for this?" Giuliani emphatically stated on Sunday that the president’s hypothetical testimony about a key Trump Tower meeting with Russians in June 2016 would “be exactly the same” as those who attended, including Donald Trump Jr. and Jared Kushner, but noted there is “real, real hesitation” about letting the president provide that testimony. An individual working on behalf of Russians ahead of that New York meeting told Trump Jr. that the Russians had damaging information on then-candidate Hillary Clinton. “There was no discussion with [President Trump] about this [meeting], and nothing happened from it,” he said. 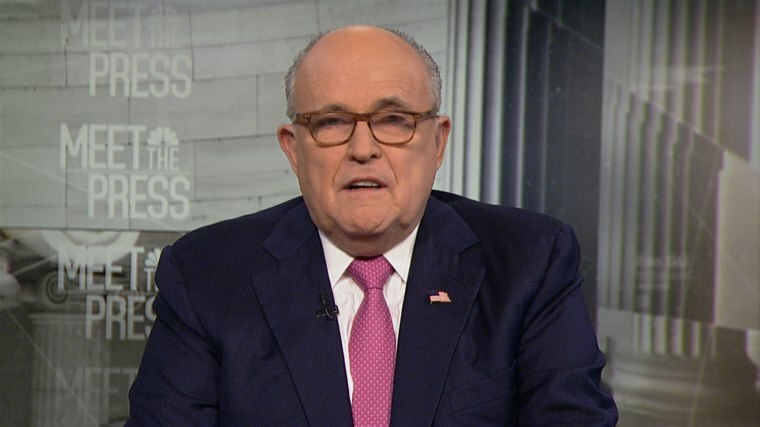 Giuliani said the president and his legal team “await the decision of the independent counsel” on an interview request. Giuliani also welcomed the cooperation of Michael Cohen, Trump’s now-former personal lawyer, with federal investigators. “It’s going to lead to nothing,” Giuliani said about Cohen’s potential testimony. Amid the investigation into the Trump campaign’s involvement with Russia, which has resulted in multiple indictments and guilty pleas, the president will now meet with Russian President Vladimir Putin later this month to discuss the two countries’ relations.